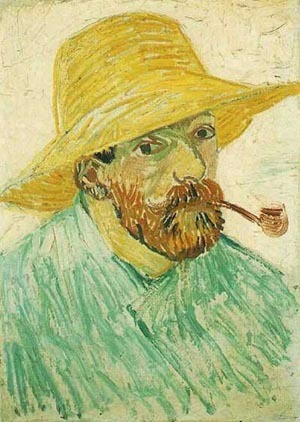 Vincent van Gogh was a unique artist who worked with a sense of urgency which often caused him a great deal of stress. He was famed for his bold, dramatic brush strokes which expressed emotion and added a feeling of movement to his works. It´s thought that he often used paint straight from the tube (impasto) and in the 70 days leading up to his death, he averaged one painting per day. Largely self-taught, van Gogh started his career copying prints and reading nineteenth-century drawing manuals and books. His technique grew out of the idea that to be a great painter you had to master drawing first. Van Gogh felt it was necessary to master black and white before working with color, and so he focused on learning the essentials of figure drawing and depicting landscapes in correct perspective. It was only when he was satisfied with his drawing technique that he began adding in colors and his bold palette became one of the most recognizable features of his later work. Van Gogh completed over 1,000 drawings in total and regarded drawing as a basic task enabling him to grow artistically and to study form and movement. Drawing was also a means of channeling his depression. Van Gogh's drawings are special due to the fact that his depiction of figures, light, and landscape can be admired without the need for color. The artist drew using pencil, black chalk, red chalk, blue chalk, reed pen and charcoal, although he often mixed mediums when drawing. He drew on a variety of paper types and used any material available to him. Drawing allowed van Gogh to capture light and images more quickly than with painting and it was often the case that he would sketch out his vision for a painting before starting the painting itself. As well as drawing, van Gogh produced nearly 150 watercolor paintings during his lifetime. Although these did not feature his unique brush stroke textures, the watercolors are undeniably van Gogh because of their bold, vibrant colors. Initially, van Gogh would use watercolors to add shades to his drawings but the more he used them, the more these pieces became works of art in their own right. In 1882 van Gogh began experimenting with lithography and went on to create a series of ten graphic works: nine lithographs and one etching. 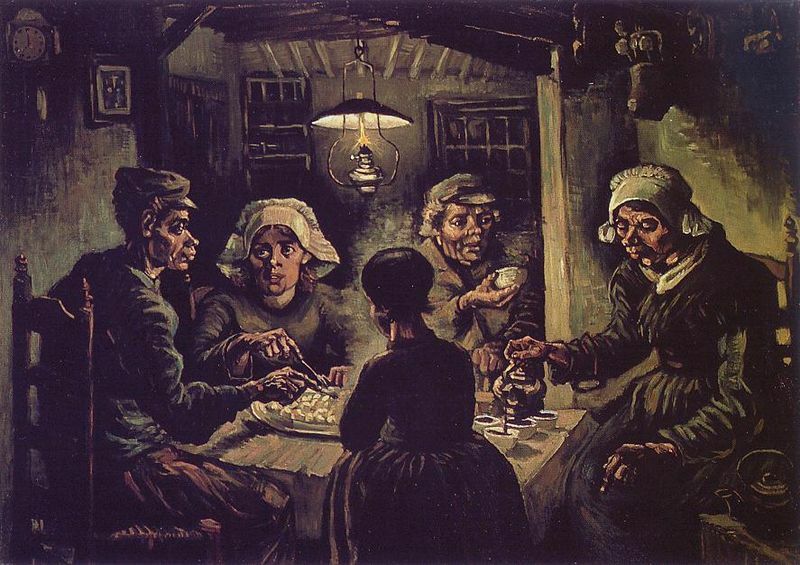 The Potato Eaters was intended for the marketplace and he made a lithograph of the piece so that it reached a broader audience and in an attempt to earn some money. Many people consider Van Gogh's letters to be another form of artwork because they include sketches of works that he was focusing on at that time or had just finished. These sketches are proof of van Gogh's growth and they show the progression of his masterpieces. 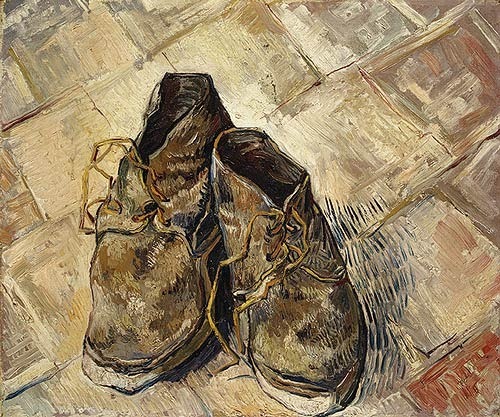 In his early career, van Gogh painted with dark and melancholy colors that suited his subjects at the time, namely miners and peasant farm laborers. However, his style changed immensely when he moved to Paris in 1886 and was greatly influenced by the work of the Impressionists and Neo-Impressionists. He began using a lighter palette of reds, yellows, oranges, greens, and blues, and experimented with the broken brush strokes of the Impressionists. Van Gogh also attempted the pointillist technique of the Neo-Impressionists whereby contrasting dots of pure color are optically mixed into the resulting color by the viewer. Such experimentation was evident in Self-Portrait with a Straw Hat of 1885. Van Gogh was also hugely influenced by Japanese prints and he painted dark outlines around objects, filling these in with areas of thick color. His choice of colors varied with his moods and occasionally he deliberately restricted his palette, such as with Sunflowers which is almost entirely composed of yellows. Vincent van Gogh painted over 30 self-portraits between the years 1886 and 1889, reflecting his ongoing pursuit of complementary color contrasts and a bolder composition. His collection of self-portraits places him among the most productive self-portraitists of all time. Van Gogh used portrait painting as a method of introspection, a method to make money and a method of developing his artistic skills. In 1888 van Gogh moved from Paris to Arles and lived for some time with Gauguin. Gauguin bought a bale of jute and both artists used this for their canvases, causing them to apply paint thickly and to use heavier brush strokes. 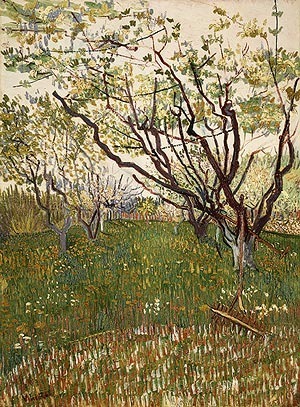 Van Gogh started to imitate Gauguin's technique of painting from memory during this time which resulted in his paintings becoming more attractive and less realistic. 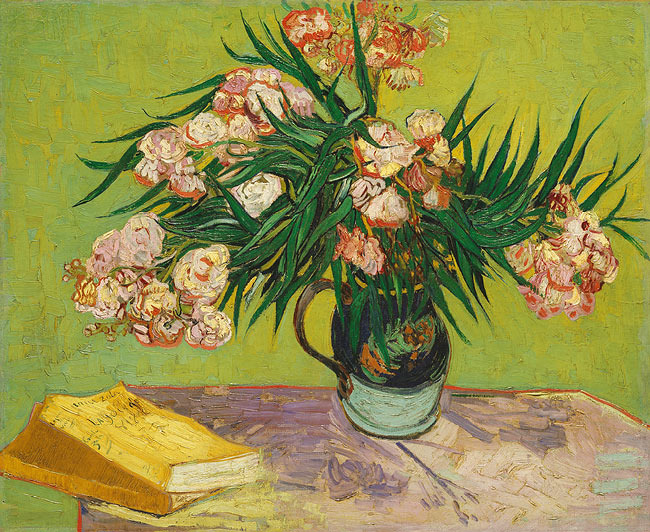 Van Gogh's emerging style saw him emotionally reacting to subjects through his use of color and brush work. He deliberately used colors to capture mood, rather than using colors realistically. No other artist was doing so at this time. Van Gogh said: "Instead of trying to reproduce exactly what I see before me, I make more arbitrary use of color to express myself more forcefully." Inspired by the light and vibrant colors of the Provençal spring, Van Gogh created 14 paintings of orchards in less than four weeks, painting outdoors and changing his style and technique. The composition of The Flowering Orchard is evidence of the influence of Japanese prints and pieces such as Oleanders and Shoes resonates with the artist's personal imagery.